The German speaking critic praised the work of Jorge Sánchez-Chiong, as accoustically powerful, as an extremely virtuousic play of colours, intense, compact, hyper-fast, and singular master pieces. 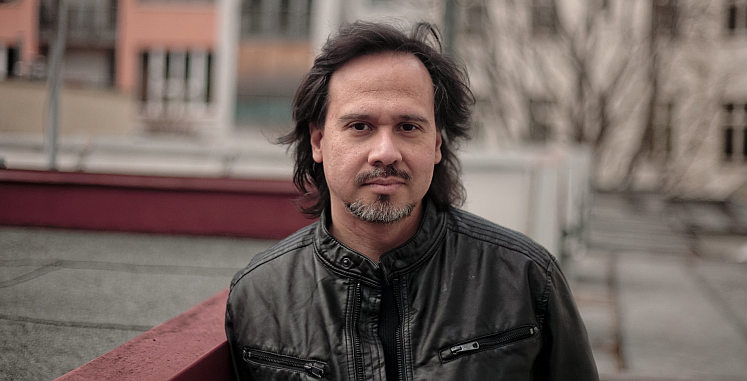 The Austrian/Venezuelan composer of Cuban/Chinese origin lives as a freelance composer and turntable artist in Vienna since 1988, where he was commissioned to write a great number of works for the most important New Music ensembles, orchestras and Festivals. His extremely rhythmical compositions seek to capture the liveliness and spontaneity of an improvisation. Going beyond the realms of concert music, Jorge Sánchez-Chiong breaks down boundaries by co-operating with artists from new movements including from the experimental theatre and electronic music scene, science, performance (Thomas Jelinek), choreography (Brigitte Wilfing), turntablism (Sudden Infant, Pure), as well as film and video artists (Michaela Grill, TE -R). So far his work has been performed in Europe, North and South America, Asia and Oceania. Sánchez-Chiong studied composition at the University of Music and Performing Arts Vienna (Francis Burt, Michael Jarrell). At the same university was he artistic director of NeW_AiR (New experimental Ways & Artsits in Residence), a project for the exchange of new media and non formal tendencies. He is tutor at Impuls Graz, and since 2010 tutor for composition at the International Summer Course for New Music in Darmstadt. Sánchez-Chiong was guest professor for electronic composition at the Zürich University of Music (ZhdK/ICST). He won several times the Stipend for Composition of the Culture Ministry of Austria, the Music Prize of the City of Vienna, the Stipend for Composition of the Vienna Symphonic Orchestra, and was artist in residence at several institutions and ensembles. Over the past few years, Jorge Sánchez-Chiong has created increasingly precise techniques of intermeshing seemingly immediate expression and complex messages – improvised and composed hybrids: Noise and instrumental, turntable and orchestral sound, chamber music and video art. Commissioners: Neue Musik Darmstadt, Neue Kammermusik Witten, Luzerner Festspiele, Konzerthaus Vienna, Konzerthaus Berlin, Traiettorie Parma, filmarchiv austria, transart Bolzano, Transit Leuven, Wien Modern, Bregenzer Festspiele, Jugend Oper Stuttgart, musikprotokoll, Jeunesse Special, Linz 09 European Cultural Capital, Klangforum Vienna, Nadar/Belgien, Phace Contemporary/Austria, Collegium Novum Zürich, decoder/Hamburg, Stroma/Neuseeland, China FMW/Taipei, MIVOS Quartet/New York, Mahler Chamber Orchestra, Radio Symphonieorchester Vienna, Basler Sinfonieta, and soloists like Patricia Kopatchinskaja, Ernesto Molinari, a.o.